Has Drudge Report Joined Fake News? Can anyone explain why Drudge has been publishing news to discourage the nation? To me it looks the same as the Demonrat practice of suppressing conservative turnout at elections by publishing falsified poles. Dr. Eowyn has recently been plugging the alternative news aggregator, Wharfinger.com, as a better resource than Drudge. And considering headlines like the ones highlighted above, I must agree with her. I would love to hear from Dr. Eowyn and our readers what has happened to Drudge. As I tried to search out the subject on Google it seemed there was a stunning silence on the subject. Dr. Eowyn, thank you in advance for weighing in on the subject. Am I seeing things correctly, or am I just whining because I don’t like bad news? Looking forward to what others have to say on this. Did you ever wonder how each new batch of conservative representatives we have been sending to Congress ends up neutered, powerless, voiceless? I thank God for sending a Donald Trump to get in there and rip the curtains wide open on the dirty racket that is Washington, DC. May the Lord hear our prayers, and rescue us from this evil cabal, before we repeat the horrors of the French Revolution. Appearing on Jimmy Kimmel, Hillary promised that, barring any national security risk, if elected president she would open to the public the government’s files on the mysterious Area 51 in the Nevadan desert. There have been persistent rumors that Area 51, a U.S. Air Force facility the existence of which has only recently be acknowledged by the government, is the site of an UFO crash in the mid-1950s. Although Drudge Report does not credit the source of the Hillary pic, Matt Drudge is not known to post photocopied pictures. Thus, we can assume that the photo of Hillary has not been altered. Take a good look at her eyeballs. Note the strange color (chartreuse!) of her irises, and shape of her pupils. Her eyes look like those of a lizard . . . or of a fictional dragon named Smaug, as envisioned in Peter Jackson’s The Hobbit: The Desolation of Smaug. Note Smaug’s oddly-shaped pupils. Our eyes are windows into our souls. Or, as FOTM reader Steven Broiles observes, possessed. Clinton voter fraud at Iowa Caucus? The first chance they got they commit voter fraud. Anything to which Drudge Report links, automatically takes on a sheen of credibility. The video is a segment from CSPAN’s live coverage of the Democratic caucus of Polk County’s precinct #43, held in Roosevelt High School, Des Moines, on February 1, 2016. In the caucus, votes were tallied by a primitive method of hand counting the raised hands of the people in the room. Bernie Sanders supporters are pointing to the video, claiming it showed there was Clinton voter fraud in Precinct #43 because of the discrepancy between the results of the first and second hand-counts. In other words, they lost 3 people but Clinton’s vote went up by 22, making her the winner of Precinct #43’s caucus. The video begins with a woman in a red “Bernie” t-shirt doing a second hand count of Sanders supporters. At the 0:43 mark, she announces the result: 223! At the 1:20 mark, a heavy-set woman with short brown hair in a blue t-shirt says the count for Hillary is 232. At the 1:40 mark, she says that some people had already left the caucus — “some people walked out the door” — which would account for why the total of the second hand count (456) was 3 fewer than the first hand count (459). Gentsch asked the people in the room if they wanted a recount. A majority raised their hands for “No”. Some of them went for Sanders in the second hand-count, increasing his votes by 9, from the first hand-count’s 215 to 224. Others went for Hillary in the second hand-count, increasing her votes by 22, from the first hand-count’s 210 to 232. The discrepancy of 3 between the total number of votes at the first and second hand-counts can be explained by “some people walked out the door”. I know this is terribly important to Bernie Sanders supporters, and far be it for me to actually defend Hillary Clinton, but I do care about the Truth. From the CSPAN video, I’m not convinced there was voter fraud at Precinct #43. Besides, the people at that precinct overwhelmingly consented to the results of the second hand-count by rejecting a recount. If they don’t care, why should we? As for reports that 6 precincts used coin tosses to decide Hillary as the winner, The Atlantic points out that coin flips were used where there was a tie, and that Bernie Sanders had won a sizable share of coin tosses as well, according to information provided by the state Democratic Party. This caption could be attached to any picture of Michelle. Is it legal to say that? I first noticed these extraordinary pics of Obama on Drudge earlier today. The pics are wire service photos of Obama campaigning over the weekend. By this afternoon, Drudge had added a reference to Rush Limbaugh also noticing the pics. Trust what your instincts tell you. Look at those eyes. Eyes of pure evil. Eyes of madness. I and others noticed his evil eyes back in the 2008 campaign [see HERE], but now they’re much much worse. I agree with Rush: They are demonic, unholy. Obama’s mask — the sociopathic narcissist’s “charming social mask“ — is slipping and what’s emerging ain’t pretty. 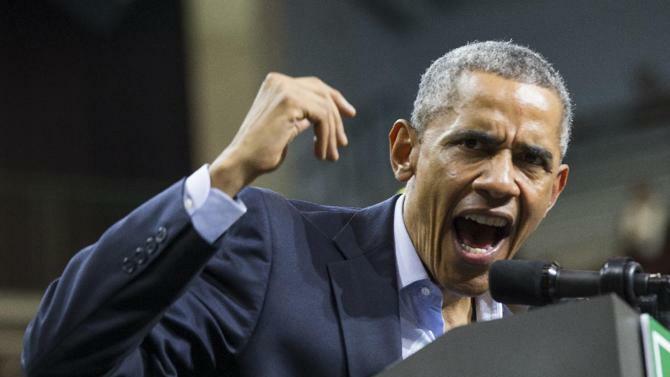 Looks like those reports of Obama being gripped by paranoia, depression, and schizophrenia are right, as are the reports of top Democrats considering invoking Section 4 of the 25th Amendment to remove Obama….